New evidence is emerging of alleged ethnic killings committed during more than a week of fighting in South Sudan. The violence follows a power struggle between President Salva Kiir, a Dinka, and his Nuer ex-deputy Riek Machar. A reporter in the capital, Juba, quoted witnesses as saying more than 200 people, mostly from the Nuer ethnic group, were shot by security forces. 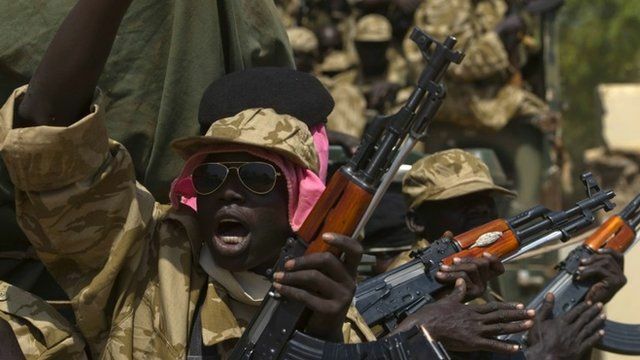 Another man in Juba said gunmen from the majority Dinka ethnic group were shooting people in Nuer areas. The fighting first erupted in Juba last week and has spread throughout South Sudan, with rebels supporting Mr Machar seizing the major towns of Bor and Bentiu, north of the capital. Bentiu is the capital of the oil-producing Unity State. Mr Kiir has accused Mr Machar, who he sacked in July, of plotting a coup. Mr Machar denies he is trying to seize power, while the government has denied it is behind any ethnic violence. The fear is that the personal rivalry between the former allies will spark a full-scale conflict between the Nuer and Dinka groups. Hannah McNeish, a journalist in Juba, told the BBC that she had interviewed a man called Simon, living at a UN camp, who said he was shot four times but managed to survive a mass killing by hiding under dead bodies. "He tells of being rounded up with about 250 other men, driven to a police station in one of Juba's busiest suburbs. He describes an ordeal whereby over the course of two days, forces outside the windows fired into this room, killing all but 12 men," she said. McNeish said this account had been corroborated by two other survivors at the camp. Another man interviewed at the UN base in Juba reported that Dinka gunmen were shooting people in Nuer districts who did not speak the Dinka language. UN humanitarian co-ordinator Toby Lanzer, who was in Bor over the weekend, told the BBC he had witnessed "some of the most horrible things that one can imagine". The claims of atrocities have not been independently verified. The official death toll stands at 500, but aid agencies say the true figure is likely to be much higher. There has also been fighting in Upper Nile State but few details have emerged. Another 81,000 people have been displaced, the UN's humanitarian agency says, with about half seeking shelter at UN bases. It warned many more people could be affected in more remote areas. The UN has 7,000 soldiers deployed in South Sudan, but on Monday, Secretary General Ban Ki-moon urged the Security Council to reassign another 5,500 troops from UN missions in other African countries, including Liberia and the Democratic Republic of Congo. He also asked for hundreds more police, three attack helicopters, three transport helicopters and one military transport plane. He has said all reports of human rights violations and crimes against humanity will be investigated and those responsible held accountable. Two Indian peacekeepers were killed last week in a rebel raid on a UN compound. President Kiir has said he is willing to hold talks with Mr Machar - and that a delegation of East African foreign ministers had offered to mediate - but that his former deputy would have to come to the table without any conditions. Mr Machar told Reuters news agency that he was open to dialogue if his political allies were released from detention. Sudan suffered a 22-year civil war that left more than one million people dead before the South became independent in 2011. Tis because some power want the earth that they are chasing the people from. Can't we see. Where these people get money from to buy all these weapons to kill one another? They are after the mineral underneath the earth. That is the aim. Get them to fight one another and so they run leave the land, when they leave the land, the Pirates come in and take over that part of the land. Karma going to hold all yo. Don't worry.